There's something about a warm, sunny Southern California afternoon that makes a rider feel a bit more bold, that draws you into a road and makes you want to give it all she's got. The playground is a strip of asphalt officially known as "Sage Rd" laid down over rolling hillsides just outside the wine country of Temecula. 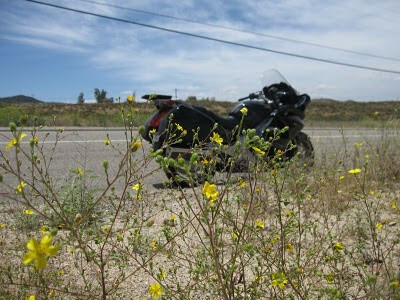 A tight, twisty, two lane road, it carries ranchers, vinters, and motorcycle riders for 15 miles through an area originally traveled by the old Butterfield Stage line. A long straight-away approaches Sage from the north allowing us to stretch our bodies before settling into our seats and putting these machines to task. But no sooner than we're loosened up that we spot a slow-moving convoy of cars up ahead lead by a truck and horse-trailer, and they're too far down this straight-away to pass them up before the twisties. On the other hand, 160 horsepower at your disposal can bail you out just about any time. A friend of mine was able to convince a dealer to let him take one out for a demo, and was given the green light to take it out all afternoon long, and even let his friends try it out too. So there I was on this GT slowing down to a horrific 25mph behind a procession of Hyundais, Buicks, and Volvos on what would otherwise be 15 miles of fun riding. The convoy was like a cortège of heavy hearted mourners falling in line behind a languid procession that looked as if they were filing their way up to Eternal Hills. Not wanting to conform, I looked for an escape plan. I was able to peek between a couple of a grassy mounds of earth and noticed the opposing lane up ahead was clear for a good portion. I seized the opportunity by pulling out of the formation, crossing over the double-yellow and putting all 160 ponies to task, passing by one car after another. The horse-trailer was in view and I knew the promised land was up ahead. However, I found myself having to pass while in a right-hand curve. It wasn't a tight curve, but enough of a curve that the cars I was passing had blocked my view of the road ahead. I could no longer tell if there was a car coming at me. I cranked the GT up as fast as I could while holding steady around this curve, taking a hard lean, and putting faith that there were no cars coming at me. I could hear the tone of its inline-four increasing it's pitch while I kept my eyes planted on the road ahead looking for any sign of on-coming traffic. But of course, there was no on-coming traffic. I had checked before I made my pass. 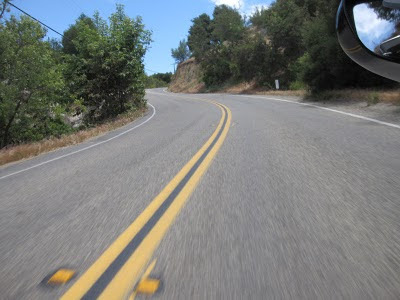 But yet it still felt precarious passing cars in the middle of a right-hand curve, and it made me want to crank that GT up as hard as the road and my skills would allow. And I wouldn't do this on my old Electra Glide. That bike took longer to get up to speed, and to round such a curve at this high of a velocity would have meant scraping floorboards, and even putting that bike into a wobble. It's not that it wasn't possible on the Electra Glide, it just required more determination, more skill, and more balls. The BMW K1300GT offers so much more power and ease of handling, that it makes you feel more confident about doing this in shorter time. True, it wasn't a smart move to make, considering this wasn't even my bike, but I knew I could do it. I knew had the space and the power. I had faith. And when I finally reached the promised land I thought "Ok Steve, let's not do that again!" The years of riding cruisers with their low ground clearance, heavy steering, and poor acceleration kept me honest and humble all that time. I'm not a more skillful rider because of the Honda ST or the BMW GT, I'm not even more gutsy. But as the horsepower increases, as the handling gets easier, and as the braking gets better, the bike allows us to do things that you wouldn't do on other bikes. But you know you can do it, you've got the machine to do it. I mean the road just lays down for you like a woman, with all her curves to be enjoyed; all you need to do is just pass these cars and it's all yours. 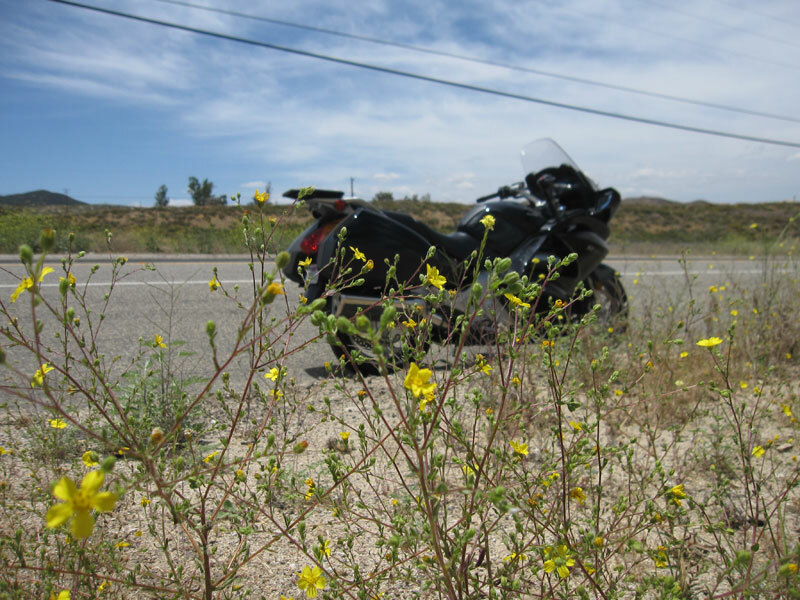 Yet again, there's something about a sunny warm Southern California day, the bright yellow wildflowers in bloom, some dry clean asphalt, and the promise of some open road, that just makes you wanna take that chance. We’ve got the same roads here in central CA. I take the same dumb chances and say ‘I won’t do that again’. Then I do it the next time anyway. Why? No clue. Because I can I guess. Yeah Willy, I've noticed those roads on Google Maps. I'm going to hit them all. We all do it, but I think the difference is that seasoned riders KNOW they are dumb moves and at least try to do them as safely as possible. 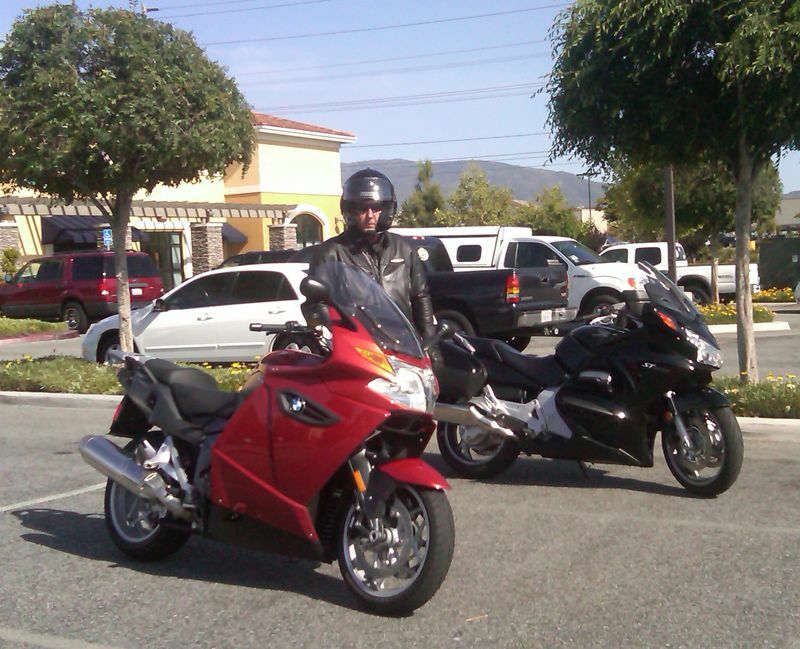 The guys that scare me (and cause all our insurance rates to go up) are the squids on their new hyper-powered sports bikes who are so green they have no clue that what they're doing is dumb, or any idea how to get out of a fix if something goes wrong.